I had Great British Bake Off withdrawals for quite a while after this past series ended. I can't imagine what the new version of the show will look like, and I havent made up my mind yet about whether or not I'll watch. I don't really bake biscuits and cookies very often, as compared to cakes, but I was particularly inspired by Biscuit Week this time around. 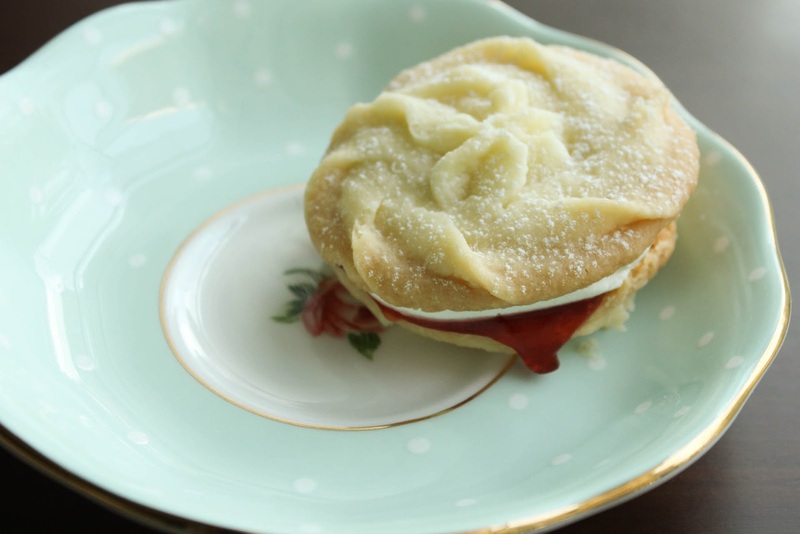 These Viennese Whirls were the technical challenge in the second episode, and they seemed like something I could pull off. Making the biscuit dough is quite simple. It's the piping that's challenging. The dough is stiff, so it takes a few tries to figure out how much pressure you need to apply, which is quite a bit. It was much easier when I piped out the second batch, as the heat from my hands had softened the dough a bit. So I'd recommend kneading the dough for a while, in the piping bag, before you start. Also, I knew from watching the show that it's best to freeze the whirls (about 20 to 30 mins should do) before baking them so that they don't lose their shape. In reality I'm quite sure I wouldn't last a day on the Great British Bake Off, but I was quite proud of myself for successfully making one of the technical challenge recipes from the show. They looked pretty good and tasted even better. Click here for Mary Berry's recipe. This isn't really a recipe. It's more of a suggestion. I suggest that this should become your go-to snack. It's been a lifesaver for me so many times during long work days and when I've been traveling. I'd say keep some handy at all times for hunger emergencies. You can buy this stuff too but it's so much simpler (and cheaper) to make it at home. 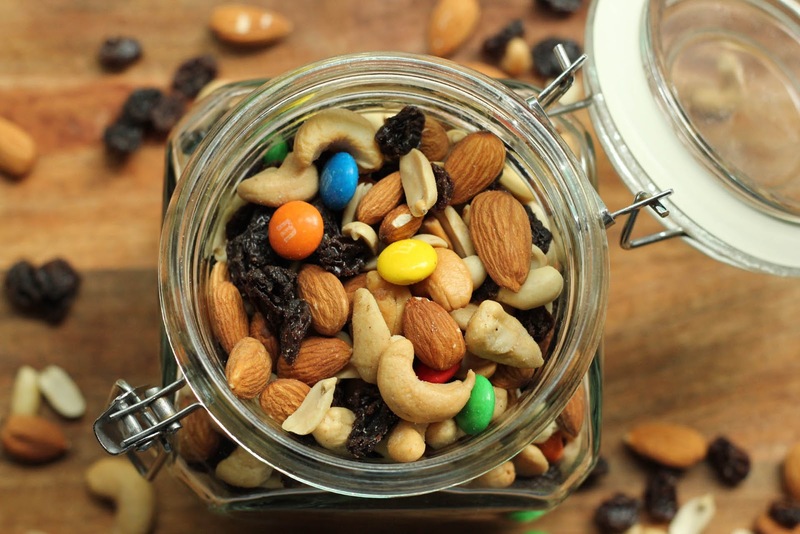 All you need for this trail mix is ½ cup each of almonds, cashew nuts, M&M's, raisins, and peanuts. Mix them all together and store in an airtight jar. A ¼ cup serving is approximately 195 calories, is an excellent source of copper, and a good source of protein, magnesium, phosphorus, zinc, vitamin E, riboflavin and niacin. 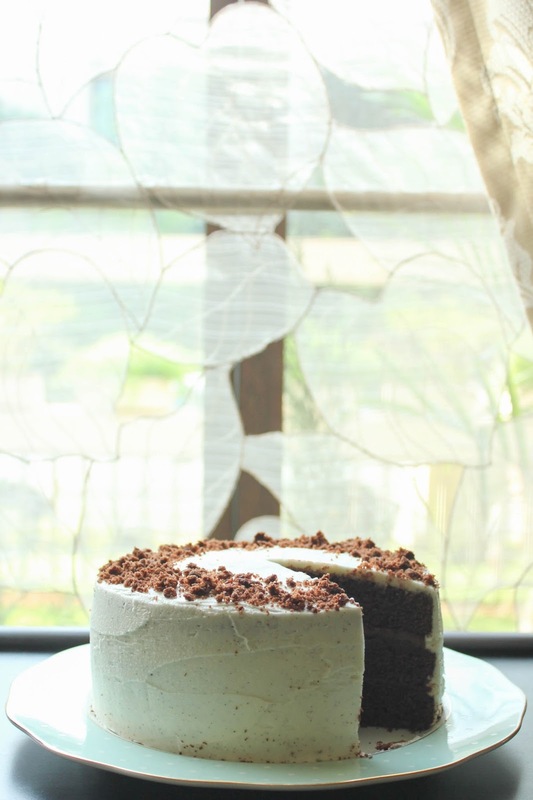 I created this recipe last year when I was asked to write an Eid-centred piece for Images. I didn't know the first thing about making halwa so I had to ask my grandmother for help, and I went through many iterations before settling on a recipe I was happy with. I made some again last night, some for us and some to take to my uncle's house this evening. It's such a festive and special halwa, perfect for the Eid holiday this time of year. Eid and mango season won't always coincide, so make this soon while mangos are aplenty. In a large cooking pan, heat the ghee. Add the cardamom pods and fry until fragrant. Add the sooji and fry on low heat until it turns light golden brown. While the sooji cooks, add the water, milk, and sugar in another saucepan and heat on medium-low until the sugar has dissolved and the mixture is just bubbling at the edges. When the sooji has browned, add the hot water-milk-sugar mixture while stirring constantly. Continue to cook the halwa on medium heat until the liquid is mostly absorbed, 20 to 30 minutes. 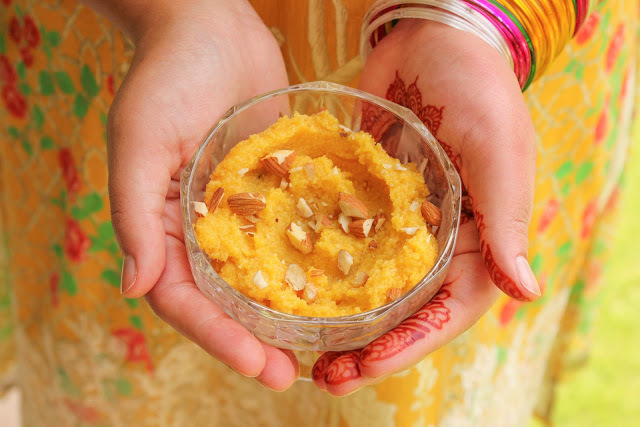 Add the mango puree and continue to cook until you have a soft halwa consistency. Cook the halwa on high heat, until you see the oil separate from the halwa. Serve warm or cold, garnished with nuts. I started making these date and nut bites a few months ago when I was struggling a bit health-wise and needed healthy snacks on hand to keep my energy up. I've been feeling much better recently but these bitesize snacks have quickly become something I can't do without. I whip up another batch as soon as I run out. 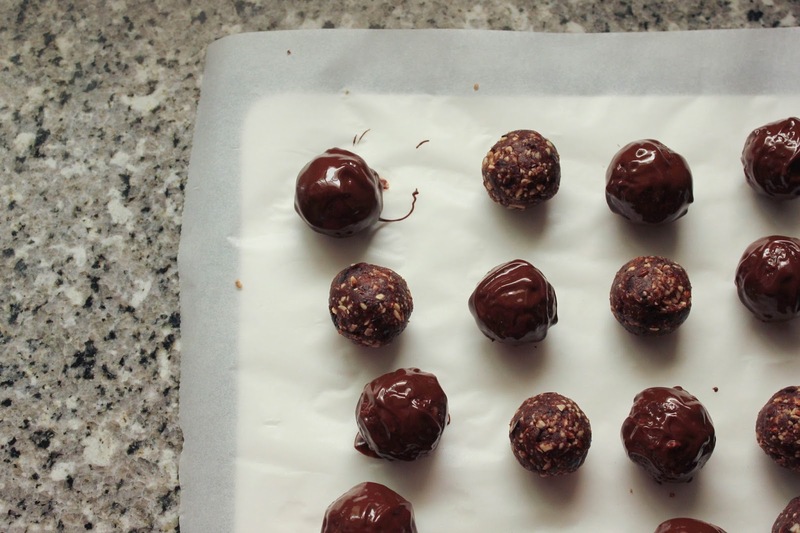 They only take a few minutes to make and are full of nutrient-rich ingredients. Last week I decided to take them up a notch by coating some of them in dark chocolate and that made them infinitely better. When you're craving something chocolaty or sweet, reach for these instead. 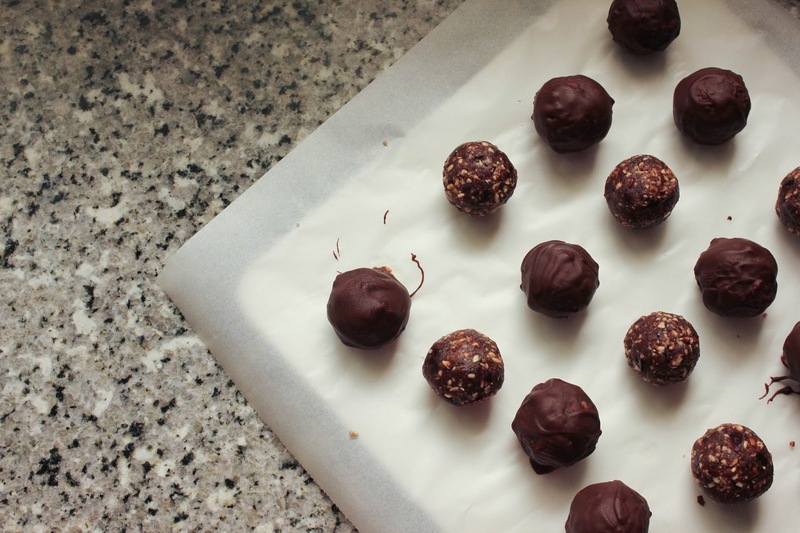 They're the perfect guilt-free sweet treat and they're good for you too. 1. 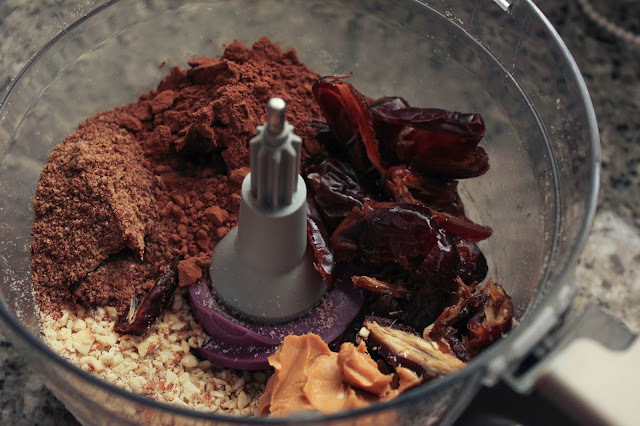 Add the almonds and cashews to your food processor and process until they are coarsely ground, about 15 to 20 seconds. 2. 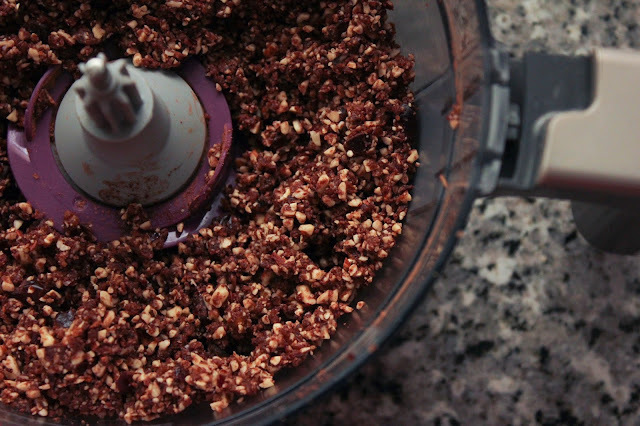 Remove the pits from the dates and add to food processor. 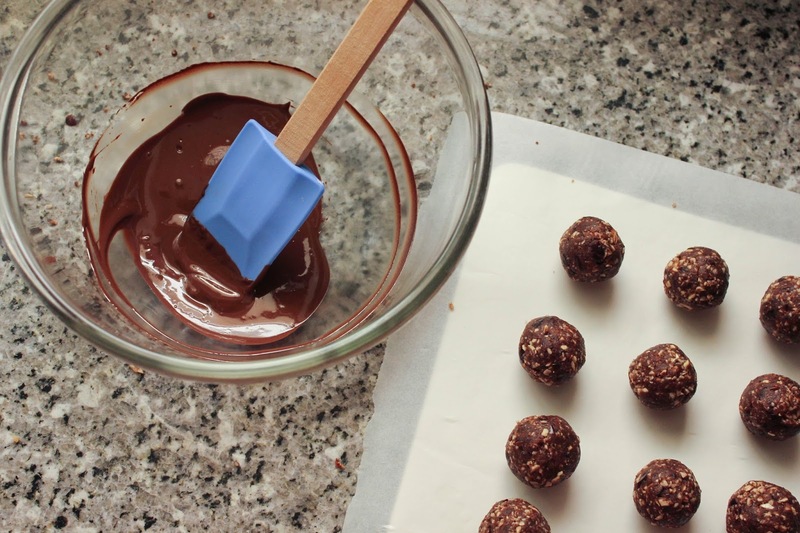 Add peanut butter, coconut oil, flaxseed, and cocoa powder (if using). 4. Take tablespoon-sized portions into the palm of your hand and press together to form a ball. Repeat with the remaining mixture. 5. Refrigerate for 15 minutes to set, then store in covered container in the refrigerator for up to 2 weeks. 6. If you are using the dark chocolate, dip half the bites in the melted chocolate, roll around to coat evenly. Use two forks to lift each one out and place on a plate lined with a sheet of wax paper. 8. Refrigerate the bites to allow the chocolate to harden. Store in a covered container in the refrigerator for up to two weeks. Whenever there is a birthday in the family, I try to bake the cake myself if I can. I had mine last week and I really wanted to use the vanilla beans I brought back from a recent trip to Sri Lanka in some way. So I decided on a classic chocolate cake and a luscious vanilla bean frosting, with a cheeky Nutella cheesecake filling to sandwich the cake layers together. I might add that it disappeared very quickly. Grease and line three 7-inch round baking tins, and set aside. In a large mixing bowl, add butter and sugar and beat with an electric beater for about 3 minutes, until the mixture light and creamy. Add a third of the flour mixture, and mix with the electric beater on low speed. Add half the milk and the coffee, and mix well. Add another third of the flour mixture, and the remaining milk, and mix well. Add the remaining flour. Use a spatula to stir the batter and make sure you get right to the bottom of the bowl. Divide the batter equally between the three prepared baking tins, and bake for 15 to 20 mins. Remove the cakes from the tins and place on a wire rack to cool completely. To make the filling: Add the cream cheese to a mixing bowl and beat with an electric mixer until smooth. Add the Nutella and beat until well combined. Refrigerate until needed. To assemble: Trim the tops of the cakes so that they are level. Place the first layer on a cake stand or serving plate and spread half the Nutella cheesecake mixture on it. Place the second layer on top of that, and spread the remaining filling mixture on it. 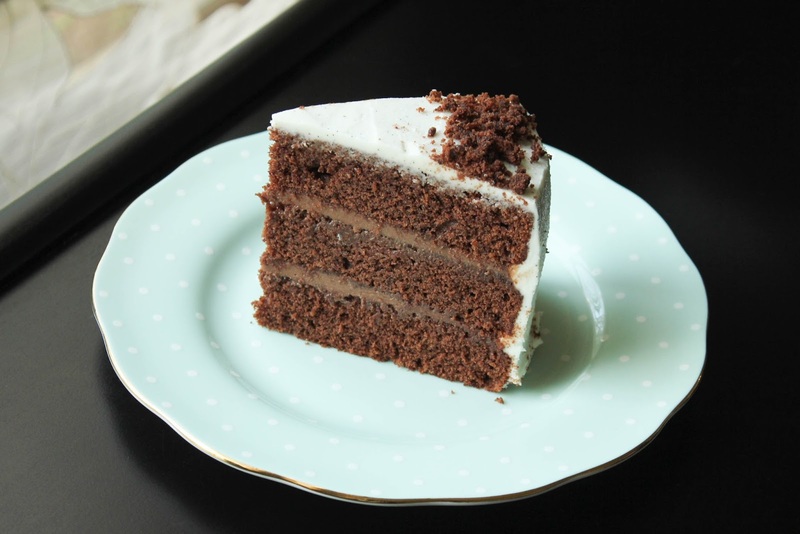 Place the third cake layer on top, and cover the cake with the vanilla bean frosting. In my 3+ years of blogging, I've only posted two drink recipes. This one is my fourth this month! A refreshing drink is an essential part of the Iftar spread and it was fun this year to try some new drink recipes. Peaches are my favourite fruit so a peach lemonade experiment was bound to happen and I'm happy to report it was a huge success. This lemonade is packed with fresh fruity flavour and though it might a bit of extra work, it beats any packaged drink mix out there. This post might just be my favourite because not only was the lemonade delicious, but just look at those sunflowers! Peel the peaches, remove the stones, and roughly chop them up. Add the peaches to a blender with 1 cup water and blend until smooth. Add the peach puree, 3 cups water, ⅓ cup lemon juice and ½ cup simple syrup to a large jug and stir. Taste and add more lemon juice and/or simple syrup if you want. Serve with ice and peach wedges/slices. When this drink popped up on my Pinterest feed a few days ago, I wanted to make it immediately. It sounded like the quintessential summer drink and it turned out to to be the perfect way to rehydrate after a particularly trying day of fasting. I scooped out some melon balls the night before and put them in the freezer to use along with regular ice. Add the watermelon to a blender and blend until smooth. Strain to remove any seeds. Add the watermelon juice to a jug. Add coconut water, lemon juice, and salt. Stir to mix. Serve with (frozen) melon balls, ice, and mint leaves.